Imagine for a few minutes what life would be like if you could not read. What would it be like to work, to shop, to travel, or to do the simple things that we take for granted, like ordering food in a restaurant, using a computer or reading the newspaper? If you were embarrassed by your inability to read, as most are, you would go to great lengths to hide your weakness, concealing your shame and probably will never reach your full potential. Imagine the embarrassment you would feel if you were a child in school when your teacher asks you to read aloud or to read a chapter from a textbook or solve a word problem in math. You might be told that you were lazy, or worse, and you might even start to believe that those hurtful words were true. In North Carolina, about 20% of adults struggle with very basic literacy skills and about that same percentage of students in school struggle to learn to read. 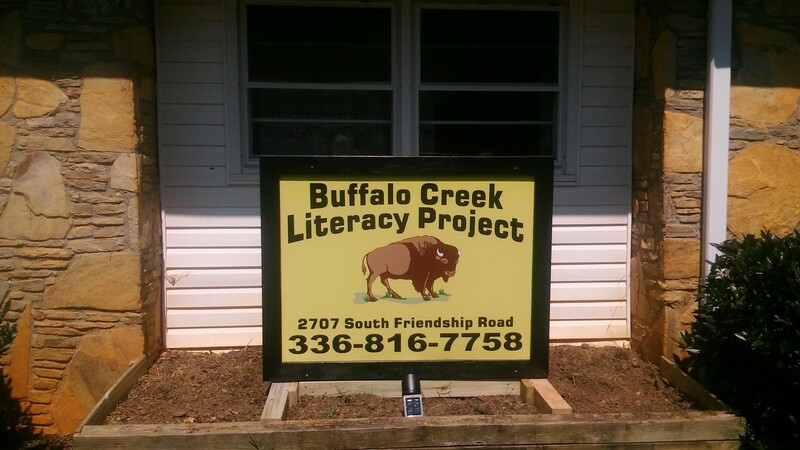 For thirteen years, the Buffalo Creek Literacy Project, a 501(c)(3) nonprofit organization, has quietly worked with adults in or around Stokes County who cannot read by providing free one-to-one tutoring. In 2012, we began to work with children who are having difficulty learning to read. Buffalo Creek is a volunteer-operated organization. No one receives any pay for the hard and important work they do. We need your help. We know that we make a real and significant difference in the lives of the children and adults we tutor within our community and in the continuing fight against illiteracy. Our volunteer tutors have given an immeasurable gift of their time, often providing support to their student that extends well beyond reading instruction. This year in Germanton, we are opening an office and tutoring center for adults and children, a dream that Buffalo Creek has had since its inception in 2004. We will be continuing our in-school program, focusing this year on grades kindergarten through 2nd, the age when reading interventions can make the most difference for students. It is our hope that we can develop a model program which can be replicated in other schools, both in and outside of Stokes County. We’re asking for your help by considering a tax-deductible gift to the Buffalo Creek Literacy Project. If you are currently tutoring through the Buffalo Creek Literacy Project, I am unable to thank you enough. If you have tutored in the past, please consider tutoring again. If you are unable to tutor, please consider a financial gift. Since no one at Buffalo Creek receives any compensation, 100% of your donation will directly support our program. A gift form and a stamped, self-addressed envelope are enclosed for your convenience. Please visit our website at www.bclpstokes.org to learn more, or contact Jeff Pratt at 336-816-7758 or by email at jeff@bclpstokes.org. Thank you for taking the time to read this letter. Have a blessed holiday season. 2018 is going to be a great year for Buffalo Creek, our students and our community! Finally, a Real Home for Buffalo Creek. Coming in October. If Stokes County Schools are closed for inclement weather, Buffalo Creek will not be operating. If Stokes County Schools are on a delayed schedule, Buffalo Creek will not operate in schools, but will maintain their regular schedule with tutoring outside of school. You can get information on Stokes County Schools’ delays and closings on our local news channel (WXII). Click here to shop at AmazonSmile for your usual Amazon purchases and support Buffalo Creek at the same time. Thank you. I just wanted to take a minute to thank you for your time, your dedication, your skills and your belief in the importance of teaching students to read. The impact of the love and the kindness you show each time you tutor changes the life of your student in immeasurable ways. It is because of you that Buffalo Creek continues to grow and is able to continue to pursue our mission, one reader at a time. I hope that you and your family have a wonderful Christmas and a blessed New Year. Thank you for what you do. You inspire me.